Greetings, Tray.io community! The Product team are thrilled to unveil the next step in our ongoing development of the Tray Platform for larger teams: Sharing Workflows. 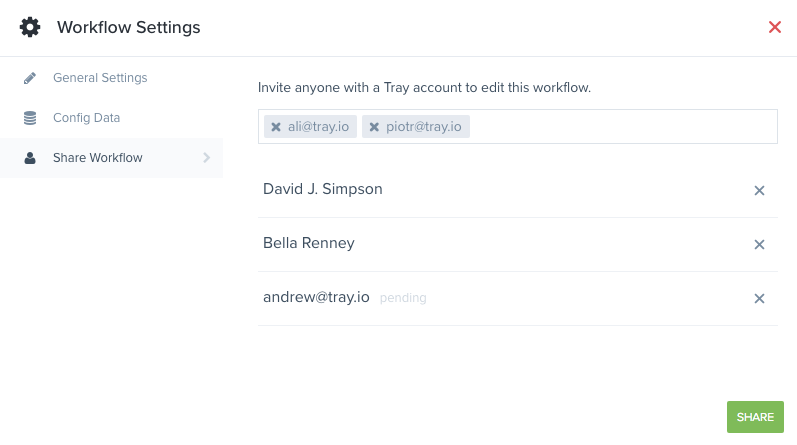 This new feature will make it easier to develop and maintain workflows and help you onboard team members who are new to the Tray Platform. You can now share your Workflows with anyone on your team. The shared workflow will appear in their dashboard and they will be able to view and edit the workflow just like you can. There’s no need to solve the same problem twice. As you start to work on a new automation, you can ask your team if they’ve built something similar before on the Tray Platform. If so, they can share their existing workflow with you and you can duplicate it and repurpose it for your own needs. More-complex workflows often benefit from another pair of eyes. Now, you can instantly share what you’ve built with your colleagues to quickly gather feedback and rapidly make your already-excellent workflows even better! When building software, it’s common practice for engineers to review each other’s code. With Sharing Workflows, you can now incorporate similar review practices for your workflows before turning them on in production. Sharing Workflows also makes it easier to make direct changes to workflows behind other team members’ accounts. You can now make critical workflows available to all necessary team members for updates and future maintenance. For more details on how to share your workflows please read our documentation and FAQs. But what about my authentications? But wait! What about authentications - your individual logins for each of the applications you’ve integrated into your workflows? Specifically, you may be wondering about an important and potentially complex security concern: When I share my workflows with my team, am I also automatically sharing the login authentications for every single one of my applications? Well, that’s pretty simple, too. When you share a workflow, all the authentications that are used in that workflow are shared too. The people with whom you have shared the workflow can only use your authentications within that particular shared workflow. In other words, they can’t create new workflows that use your auths. The Sharing Workflows feature is now available for all workflows. Just login and head to your dashboard to take it for a spin! Have questions? Please check our documentation.